The lights flickered overhead…the computer shouted a loud Kapoof! and turned off completely. I turned it back on – not thinking much of it. A little later…lights flickered and another Kapoof! from the computer. A quick glance out the window showed the electric company hoisting the boom on their truck. I took it as a sign and an opportunity to take a break, get outside and fill the tank in the car – the one last drive before the car goes Kapoof! – or – sspt sspt – sputtering out of gas. So, off to the gas station. Why not? Car needs filled. I can’t work at the moment. One last turn of the engine left on the tank…so off to fill ‘er up. At the gas station. No electricity. No electricity at the gas station means pumps won’t pump – and no gas for me. It was half comical. One more turn of the engine left? 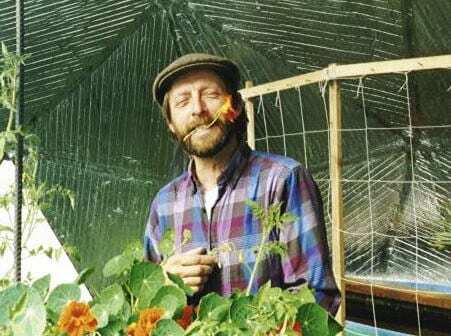 I returned to Growing Spaces®, laughing at the folly, trying to keep it light. 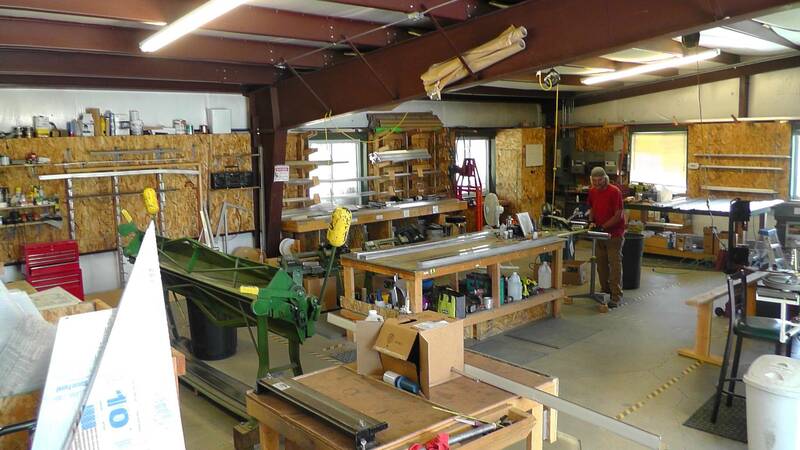 However, the shop is in full production mode. I can’t finish my post update, or fuel my vehicle, but the shop powers on like the Energizer Bunny. The rest of the world can halt to a stop, and the shop at Growing Spaces runs. 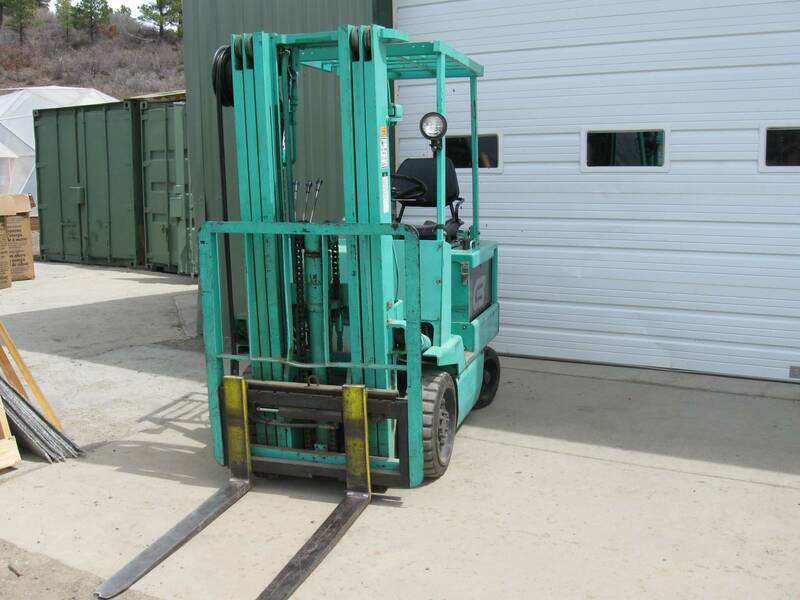 The forklift, our green glory, charges on. About twenty years ago, Udgar chose the path of self-reliance and opted out of the high cost to bring grid electricity to his home in Southwest Colorado. 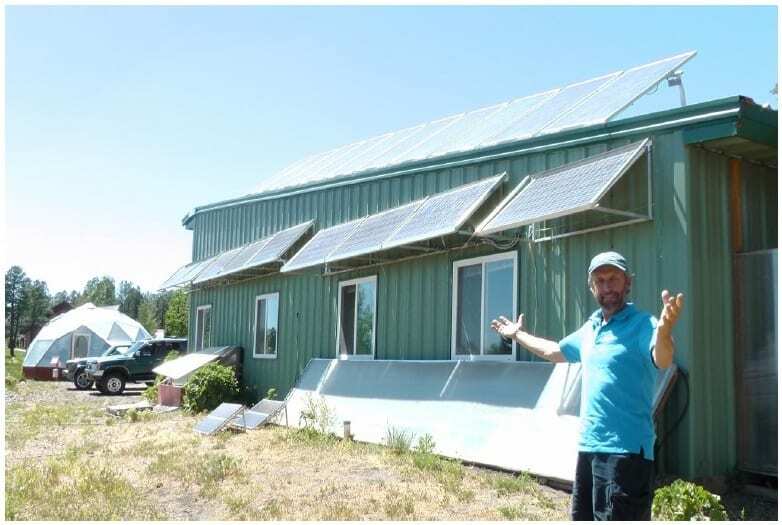 He went “off the grid” and powered his home with a stand-alone battery backup solar powered system. The first iteration involved a grid tied, stand-alone battery backup system. If the grid goes down, our production facility keeps running off the battery power. However, over time, Udgar installed a second system. It is also grid tied, but does not use batteries. The solar panels in this system contain their own micro inverter on the back of the panel. 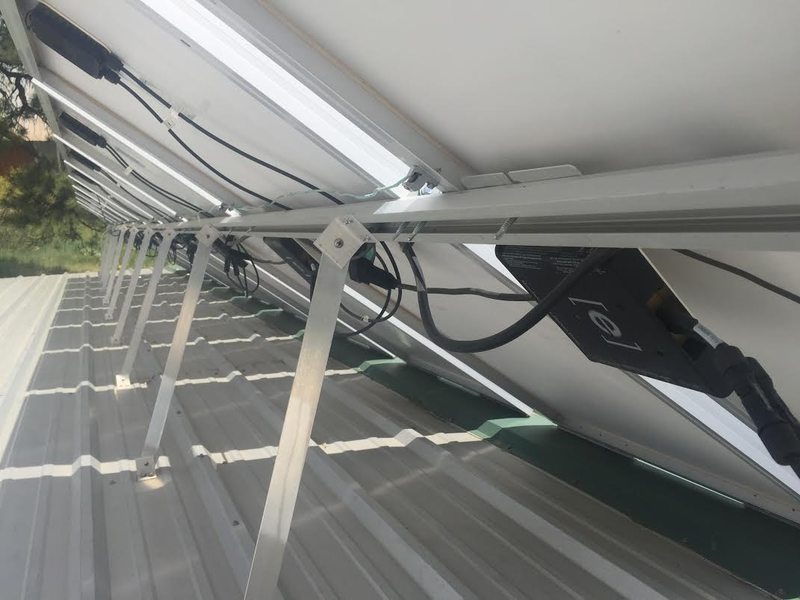 The panel generates electricity and the micro inverter changes it from direct current (DC) to alternating current (AC) and the electricity is fed into the breaker and back into the grid. On sunny days, and on the weekends, our meter runs backwards. We generate electricity and pump it back into the grid and receive meter credit. …and maybe 5 to 7 dollars extra for electricity use. The entire Shop runs of solar power. We currently generate 90% – 95% of the electricity we use. With conservation methods, such as turning off power strips and phantom loads, and generating our own electricity, we pretty much have free energy. Panels used to cost somewhere around $5 a watt. The cost has dropped significantly over the years. You can purchase panels today for as cheap as 50 cents a watt. That’s cheaper by a factor of ten. It is significant. Moreover, the panels and system will last up to 25 years. If you have ever considered utilizing solar power, now is the time. …solar power is now cheaper than coal fired electricity, or electricity generated by other fossil fuels. Solar power is more affordable now than ever. Solar systems can last up to 25 years. A solar system can pay for itself in 4-5 years. Generating electricity with solar means less fossil fuel burned in coal fired power plants. Experience the joy of independence and self-reliance. When the grid goes down, when “the system” comes to a halt…solar power keeps on going. Now, if the gas station would just install some solar power on their fuel pumps so my car could keep going. *Some shop workers were scratching their heads as to why the lights were out, but everything else kept running. The lights are intentionally tied to the grid so we know when something is amiss with the rest of the big world out there. You make me laugh. Such a fun blog. I really love it. It reminds me not to take for granted all the freedom we have living and working off the grid for so long. I often forget it. But Yay! you reminded me that we ARE very self sufficient, in this lovely mountain town. Thanks! We buy most of our solar panels from Solar Blvd.com. They always seem to have great prices. Would you please elaborate on what solar set up you use? I need to be off grid & can’t afford much. The systems that we use, in the most basic sense, consist of three components. And an inverter which converts the battery power to 110 V ac rendering it usable. There are many solar companies that can assess your particular electircal needs and use to help design the appropriate system for your needs and price point. We suggest looking into http://www.realgoods.com for ideas and resources. How big are the batteries to run the shop? Our batteries for the shop are 12 V 200 amp hour batteries. We currently use four of them. Those four batteries coul power our system for 12 hours no problem.